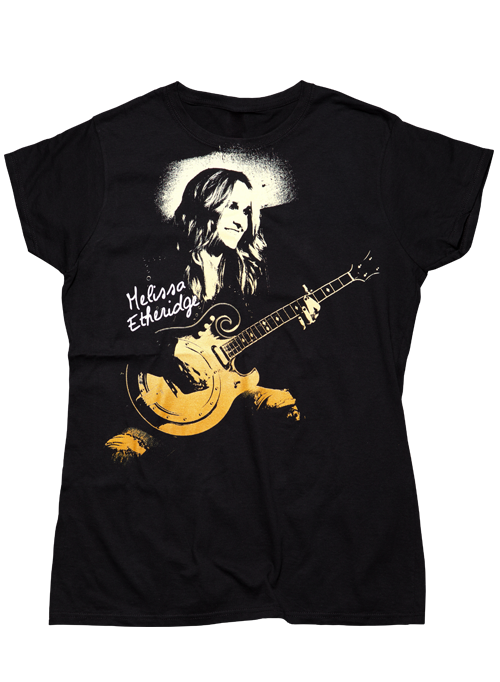 The attractive design for this Melissa Etheridge women's black gradient photo T-shirt features Ms. Etheridge smiling and playing her guitar, with her name in stylized lettering. This artistic image is based on a 2016 promotional photo. This All Over photo art is printed on a premium black ring-spun cotton short-sleeve women's tee. Show your enthusiasm for this talented musician and dedicated social activist or surprise a big fan with a special gift.